Stiggy was only 43 years when his doctor told him he would not be able to return to his house painting work after his heart attacks. So what was a man supposed to do? As his wife Barbara stated, “he can’t drink, he can’t smoke, what does a man with plenty of time on his hands do?” What else, he got tattooed! Stiggy already had several tattoos but his new goal was to take the Guinness record for the most tattoos from the current holder, a Canadian tattooist Sailor Joe Simmons. Stiggy’s uncle was a Navy man and he had memories of him and his uncle going to the Bowery in New York City and getting tattooed by Charlie Wagner. The story goes that Stiggy got his first tattoo of a heart with the word MOM written inside when he was just thirteen years old. Sailor Joe Simmons was a tough act to follow. 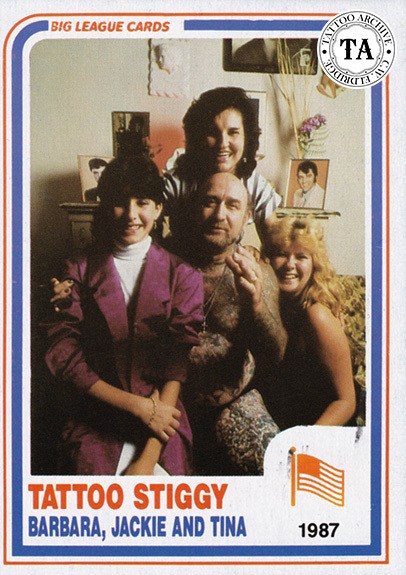 Although Sailor Joe died in 1965 the 1973 Guinness Book of Records still listed Joe as having the most tattoos at 4,831. 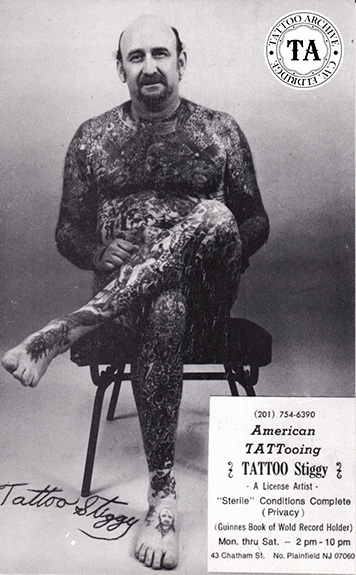 Stiggy persevered and with the help of tattooists like Chris the Greek, Ed Purcell, Bob Auer, Joseph McDonald, E. George Larsson and others, he reached his goal in the early 1980s of holding the record, with 5,555 tattoos! The Guinness record often brings some publicity and since Stiggy was supporting a family on his meager disability checks he hopped the recognition might pay off in cash. 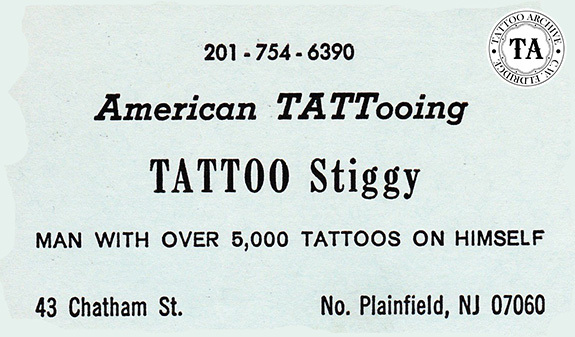 Later Stiggy owned and operated American Tattoo in North Plainfield. Stiggy was philosophical about his future as a Guinness Record holder. “I guess that winning the record will make me immortal until the next guy come along.” That next guy was Bernie Moeller in 1989 with 8,960 tattoos. 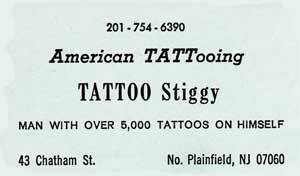 Tattoo Stiggy died in December 18, 2008 at his home in North Plainfield NJ.